State League leaders from Connecticut, Massachusetts, Maine, New Hampshire, Rhode Island and Vermont have developed a dynamic agenda for 2019 that is sure to address the most compelling issues of the year. Make your own hotel reservation at Hampton Inn & Suites, 900 Post Road, Wells, Maine 04090 (207-646-0555). Be sure to say you are with the League of Women Voters and the room rate will be $99 plus tax. Find a roommate to share, and the cost will be around $50 per person. Our block of rooms will be held until March 31, but the rate will be in effect until the event. Breakfast is included in the room rate. Saturday lunch is included in your registration fee. Saturday evening, we will have dinner in small groups at your own expense at area restaurants. Sign up at the registration table. will speak about voting behaviors, patterns, and reasons for political inactivity, specifically, what populations did not vote in 2016? Why did people not vote? What will motivate people to vote in future elections? What are the tangible and psychological barriers to voting? What was different in 2018 than in previous years? will conduct a training session on how to communicate across the divide. 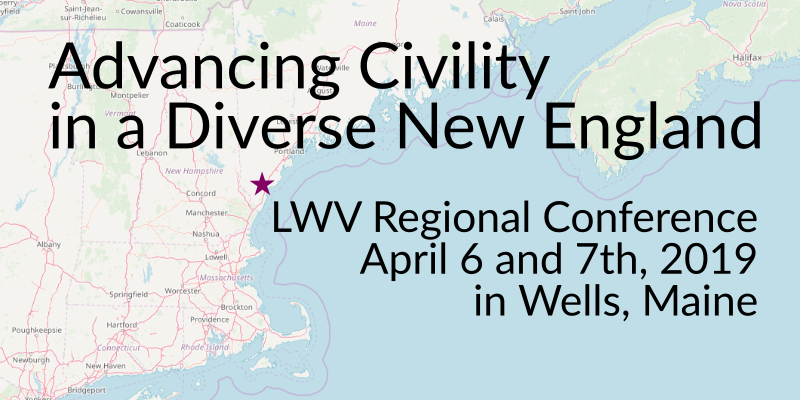 Panel presentation:What does diversity look like in New England? Further discussion about these issues will give participants a chance to dig deeper into the questions of what impact these factors have in our work in empowering voters and defending democracy. Takeaways from Saturday: What can we do to cross the divide? How does this shape leadership for the League moving forward? © Copyright League of Women Voters of Vermont. All rights reserved.